Mayor Jose L. Segarra of Killeen: Tell Sister City, Osan, South Korea, That We’re Opposed to the Torture and Consumption of Dogs and Cats. Osan became Sister city with Killeen in 1997. 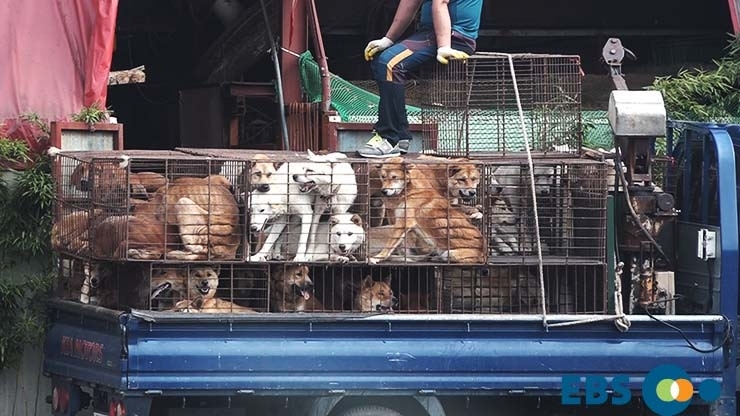 In Osan, there are countless dog slaughterhouses, markets and restaurants where the dogs, who are tortured their entire lives, end up being slaughtered in the most inhumane ways, such as by electrocution, hanging or beating; and then thrown into boiling water – sometimes while they are still alive. In many places, dogs are being killed in full view of other terrified, caged dogs; and this takes place in public and in broad daylight. In addition, many abandoned and stolen former pets end up in this industry, and are subjected to the same cruelty. The Mayor of Osan, the ‘festive city’, in South Korea, claims that his office will “continuously work together with the citizens” to create a pleasant environment … where the “joy from culture and welfare is abundant”. Key words here, culture and welfare, because it has been stated that some Koreans believe that dog eating is “part of the traditional culture of Korea” – if so, it is a part that is devoid of any animal welfare, devoid of any joy, but abundant in cruelty, greed and illegal practices. The dog and cat meat trades cannot be justified in such a prosperous country as South Korea, and whatever label one wishes to give to dog eating (culture, tradition or otherwise) there is nothing pleasant about the environment in which these pitiful animals are raised, transported or slaughtered. So, we want Mayor Gwak to carry on ‘continuously’ (unceasingly; constantly; without interruption) working with his citizens to create real joy, for the Korean people and the animals alike, by permanently ending the dog and cat meat trades in his city. 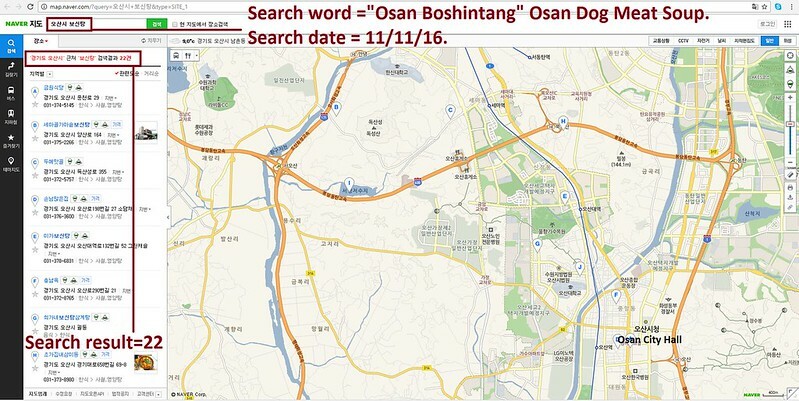 The searches resulted in: 44 Health Food Centers in and around Osan; and 22 restaurants in Osan. 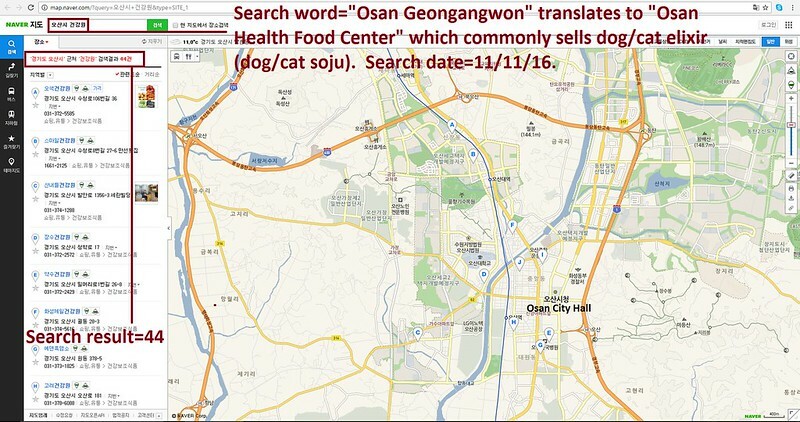 Even if half of these ‘Health’ Food Centers and restaurants serve dog and cat ‘ingredients’ in one form or another, just imagine how many dog/cat slaughterhouses must be present in and around Osan in order to supply all of these outlets. Please sign petition, call and email Killeen Mayor Jose L. Segarra TODAY! No matter where you live PLEASE SHARE these actions with your friends – especially those who live in Killeen! I just can’t understand why the Korean commission of laws and anti corruption doesn’t stop the illegal dog killing and illegal slaughterhouses ? Do they like knowing dogs are being killed everyday ? Cruel practices should not be ignored because dogs should be here on earth to help people not to eat ! we must do everything we can to stop this horrendous trade ! it’s barbaric and not cultural !! only the monsters are able to do the things this way ! the animals have the rights, we have to respect them and proctect them! Abraham Lincoln said ” I am in favor of animal rights as well as human rights, that is the way of a whole human being” I think that there’s a time to start to think like Mr Lincoln !!! All of those people should die the same way….no need for torture I don’t think God intended for these poor animals to be tortured while they die….if you spell dog backwards it is god…they will be punished by God eventually for what horrible painful deaths they put animals through…why would they think this is ok…i pray for their destruction and dam them to the fires of hell..stop this horrible horrible suffering of innocent loving animals….this is pure evil and evil will return to them…..
It’s so barbaric to think that dogs and cats don’t have a right to life. They want to live just like you do. Please show some compassion. It’s extremely evil torturing dogs and cats. Your evil cruelty is unbearable and unimaginable. Stop it. Stop, stop or land in he’ll with other devils. Stop I am so ashamed .it’s horrid and evil sick I will never visit your country . The world is watching you and seeing how you are treating these innocent, helpless, beautiful animals. You have no heart to let this go on in this day and age. Dogs are sentient beings….they feel. Stop this creulty once in for all. The world already think you are barbaric and crazy!!!! We love our animals…why don’t you? Make laws to protect them!!!! Stop this terrible suffering for these dogs !!! !